« Homepage / Other Drugs / "Sotalol"
Tendency to permanent heart palpitations (hyperkinetisches heart syndrome). The same applies to the use of sotalol, nervous disorders, nervous heart complaints, stresses, excitation, conditional allergic hypersensitivity phenomena or so-called histamine headache, disorders of metabolism or shielding of the influence of the stress hormone adrenaline. Sotalol can both be given in tablet form for taking, as well as with a syringe. 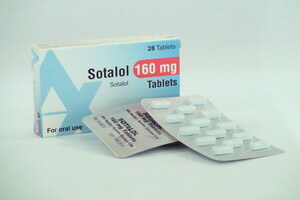 Sotalol is one of the groups of anti-Arrhythmics and blockers. The active substance affects various forms of cardiac arrhythmias. As a result, a too-rapid heart beat can be regulated under certain circumstances. Sotalol is the heart beat more slowly and evenly. The active ingredient that blocks the so-called beta receptors on the heart and the potassium channels. Thus, the drug is one of the Antiarrythmika of class II and III. Since sotalol not only to the heart coming forward, but works on all the beta receptors, it can cause unwanted side effects such as a narrowing of the bronchial tubes. Solatol can be taken in tablet form. The effect occurs two to three hours after ingestion. It keeps for about 24 hours. The substance will not be converted by the body, but again almost completely excreted via the kidneys. The medicine contains the active ingredient of sotalol in the form of sotalol hydrochloride. 70,56 Milligrams sotalol correspond to 80 milligrams of sotalol hydrochloride. The drug reduces the capacity to react and this drive and the ability to use machines. No work without secure hold may be performed during the treatment. The wearing of contact lenses can be affected by reduction of Tränenflusses. Diabetics blood sugar levels should be checked often during treatment with the drug. A certain urine examination at a tumor of the adrenal market (pheochromocytoma) elevated levels may show falsely in the application of sotalol. The dosage of the drug must not suddenly be changed (slow increase of dose, creeping out end of therapy). During the treatment with the drug, alcohol should be avoided. For allergy sufferers, the drug can cause strong allergic reactions. Food, especially milk and milk products, may interfere with the inclusion of the active substance in the body. Use of the drug should therefore be not to a meal. What interactions of active substance of sotalol in sotalol-ratiopharm 80 are known? It is important to note that the interactions can be different depending on the pharmaceutical form of the drug (for example, Tablet, syringe, ointment). The dose of sotalol may be together with alcohol or with drugs that affect the transmission of excitation in the heart, cardiac arrhythmia. Among these drugs haloperidol (Psychopharmakon), (against malaria), (to reduce the blood fats), and anti-Arrhythmics. The medicine in norepinephrine (in shock) or MAO-inhibitors, however, cause that blood pressure can rise dramatically. Common dose of calcium channel blockers, there may be blood pressure and cardiac arrhythmias. Medicines that cause potassium or magnesium loss (such as the entwässerungsmittel furosemide, hydrochlorothiazide or similar), cause additional cardiac arrhythmia due to the loss of this mineral. Cardiac glycosides and muscle relaxants how be strengthened in their effect. The effects of other beta blockers or anti-Arrhythmics are reinforced by sotalol. The bronchenerweiternde effect of Beta-2 sympathomimetic drugs (such as Fenoterol, terbutaline,) is, however, weakened, so that their dosage must be increased in May. Together with insulins and blood sugar-lowering pills, sotalol may lead to hypo. Together with alcohol and anesthetics may occur to increased cardiac muscle paralysis. The dose of the vein, there may be a marked rise in blood pressure while taking the blood pressure senkers clonidine. The drug contains 80 milligrams of sotalol hydrochloride, is available also in effective thickness to 40 and 160 milligrams. At the beginning of the treatment, 80 milligrams of sotalol hydrochloride (per two tablets) should be given twice a day. If so the desired effect is not reached, sotalol hydrochloride can be increased to 80 milligrams three times daily to 160 milligrams twice a day. For life-threatening conditions are given to 480 milligrams per day, divided into several doses. At anfallartig can murmur of the Atria of the heart the dose of three times a day 80 milligrams of sotalol hydrochloride should not be exceeded. When chronic murmur of the Atria of the heart, the dose may be increased to maximum twice a day 160 milligrams. A dose adjustment by the physician is required in patients with impaired renal function. So patients with a creatinine clearance received half of the normal dose, values under 10 millilitres per minute from ten to 30 milliliters per minute one-quarter of the normal dose. Take a whole tablets with liquid, but not without food. Especially a simultaneous ingestion of milk and dairy products must be waived. Only the doctor can determine the duration of the application. The following information about contra-indications for the purposes of sotalol-ratiopharm 80 in General, pregnancy & breast-feeding and children. It is important to note that the contra-indications can be different depending on the pharmaceutical form of the drug (for example, Tablet, syringe, ointment). When cannot sotalol-ratiopharm 80 be used? severe heart muscle weakness, treated heart muscle weakness and acute heart attack. Such patients are particularly vulnerable to suffer more cardiac arrhythmias by sotalol. Metabolic disorders such as a metabolic acidosis. untreated tumors of the market of the adrenal (pheochromocytoma). Here should be treated with alpha-Sympatholytika. severe hypersensitivity reactions in prehistoric times and patients who undergo a desensitization therapy against allergies. Increasingly, it can cause severe allergic reactions. Patients with impaired renal function. You need to get lower doses. strict fasting and in diabetes patients with strongly fluctuating blood sugar levels. Medical surveillance of contraception neglected hypoglycaemia. strong or persistent diarrhea, or simultaneous administration of drugs, which lead to a loss of magnesium or potassium. Here the mineral and the acid base balance must be checked frequently by doctors. No sufficient experience on the application of sotalol are available during pregnancy. the mother was treated with Soltalol cardiac rhythm disorders, low blood pressure, hypoglycemia and respiratory weakness can occur in the newborn. An application is therefore to stop at least 72 hours prior to the probable date of birth. This is not possible, the newborn must be monitored carefully. During breastfeeding, sotalol may be over in different concentrations in breast milk. Weakness of the respiratory and cardiac arrhythmias may also contribute to the infant. Is still breastfed babies for these signs need to be monitored. With children, no sufficient studies conducted to determine the safety and efficacy of sotalol. An application of the active substance in this age group is therefore not allowed. What side effects can the active ingredient sotalol in sotalol-ratiopharm 80 have? Below, you will learn the most important thing to any known side effects of sotalol in sotalol-ratiopharm 80. These side effects should not occur, but can. Because everyone reacts differently to medications. Please also note that the side effects in type and frequency can vary depending on the drug form of the drug (for example, Tablet, syringe, ointment). Common side effects: anxiety, confusional, mood swings, delusions, reinforced dreams depressive upsets, dizziness, drowsiness, headache, insomnia, nervous transmission sensations, cold feeling on, the limbs, vision problems, hearing disorders, chest pain, drop in blood pressure, amplification, heartbeat slow down, palpitations, ECG changes, AV-transfer errors, arrhythmia amplification, change in cardiac arrhythmias, loss of consciousness or conditions before, breathing difficulties, taste disorders, abdominal pain, nausea and vomiting, diarrhea, indigestion, flatulence, dry mouth, redness, itching, rashes, fever, fatigue. Uncommon side effects: hair loss, conjunctivitis, shortness of breath (in patients with brochienverengenden respiratory diseases). Very rare side effects: cornea/Bindehautentzzündung, angina pectoris-reinforcement, reinforcement of ciculation defects on arms and legs, conduction abnormalities on the heart (sine wave break, blocking at the AV node and bundle of his), allergic bronchitis with connective tissue formation, psoriasis triggering. Side effects without frequency: reduction of Tränenflusses (when wearing contact lenses to observe! ), muscle spasms, muscle weakness, sexual disorders. Specialties: Strengthening the cardiac arrhythmias by treatment with sotalol are possible, this can lead to strong deterioration of the heart activity (up to the cardiac). Especially in life-threatening cardiac arrhythmias and impaired function of the left ventricle, rhythm disorders can be triggered. Serious side effects of this kind are mostly dependent on the dosage of sotalol and occur mostly early after start of treatment and dose increase.